Karele ki sabji (karela stir fry) This is one of the simple recipe and easy to make karele ki sabji. This sabji taste is very good with dal-rice, chapatti or paratha. Preparation Time- 15 min. Cooking time- 20- 25 min. To makekarele ki sabji, wash and cut the bitter gourd intoround pieces. 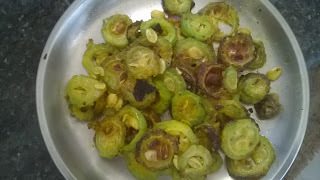 If you want to remove bitterness of karela then add salt and turmeric in karela and leave it 10 min. Take pieces of karela and add rice flour, turmeric, salt and red chili powder mix properly. Heat oil in a pan and fry karela’s till little brown, keep aside.